You don't need me, a newspaper reporter, to tell you that we're living in strange times. I think we always knew deep down that if the Cubs won the World Series there would be some irreparable shift in the universe, but then we were so caught up in the excitement of flying the W flag and watching baseball in November that it all kind of got away from us. And then less than a week later, Donald Trump was elected president. Ever since it's been one damned thing after another, including a giant fireball in the sky. And now we've had, as of the second week of August, 29 sightings of flying humanoids in Chicago. Mostly they've been observed hovering in the air, but one took a dramatic leap off the Sears Tower, and two more performed aerial maneuvers above the Adler Planetarium. ("They flew figure eights around each other," a witness recounted. "It looked like they were dancing in a strange sort of way. It was actually quite beautiful, considering how freaking strange it was.") 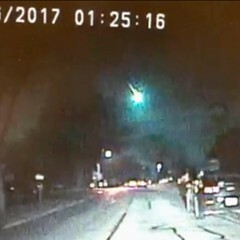 One of the sightings was reported by a police officer and confirmed by a self-described aspiring journalist, both of whom saw a tall, thin figure jump off an apartment building in Auburn Gresham and fly away. Lon Strickler, who has been investigating flying humanoids since the late 1970s and has been keeping records of the current rash of sightings on his website Phantoms and Monsters, says he has never heard of so many reports from one place in such a short period of time. 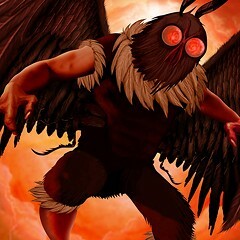 In comparison, the Mothman, who haunted the skies above Point Pleasant, West Virginia, in the late 1960s, was a retiring homebody. Most of the flying humanoids here have been spotted around Lake Michigan, which makes sense to Strickler. Lots of weird stuff appears around Lake Michigan, like unidentified flying crafts and orbs. Maybe the lake is some sort of portal—he's not really sure. Anyway, based on the reports coming in from Chicago, Strickler thinks that there have been three separate humanoids flying around. 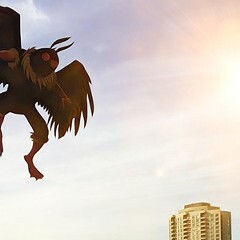 The earlier sightings were of a tall, feathered being with wings and glowing red eyes. The second wave were possibly lechuzas, Mexican witches that transform into owls or eagles. But the most recent sightings have most closely resembled large black bats between six and eight feet tall with a wingspan of about 12 feet. Strickler feels confident that these are, in fact, flying humanoids and not gliders or drones or large birds and that the people who have been calling in the reports are sincere. He says his BS meter is pretty good. But he's still not sure what the humanoids are or what they want. "It may very well be an extradimensional traveler of some type," he says. 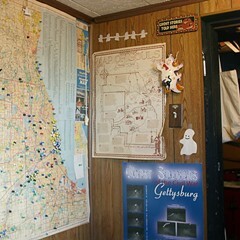 Strickler himself has seen a flying humanoid six times and Bigfoot once. 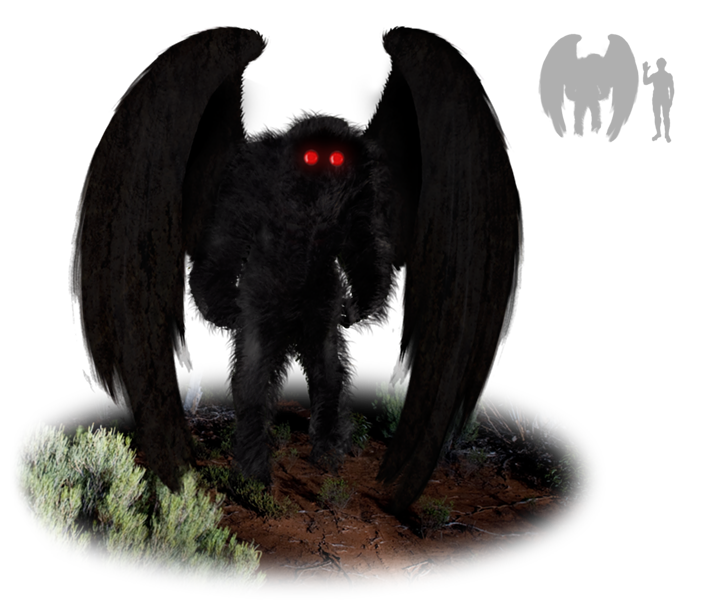 His first encounter with a flying humanoid was back in 1988, at a Boy Scout camp along Conewago Creek near his home in southeastern Pennsylvania. Some of the Scouts reported hearing an eerie noise that sounded like a crying baby. It scared them, so Strickler and a band of investigators went into the woods to check it out. In the middle of their second night in the woods, they found the source of the sound. "We all had flashlights," he remembers. "It shot out of the creek like a rocket. One thing all of us noticed was the bright red eyes. It was six foot tall, with wings behind its back. It just shot up. As it started flying away, we heard the screaming sounds. It was pretty dramatic. But it wasn't a harbinger thing. I believe that it's something that lives around the creek." One of the more comforting things about talking to Strickler about paranormal phenomena is his matter-of-factness in recounting what happened, and, more importantly, his reluctance to ascribe any particular meaning to these phenomena. Yes, the Mothman appearances preceded a bridge collapse that killed 46 people, but Strickler says that doesn't prove anything. "There's been a stigma attached to these flying humanoids, that they're a harbinger of something bad to come," he says. "Then people use it as an excuse for something that happens. I don't really want to predict anything that's going to happen in Chicago." And as of yet, nothing bad has really happened, except that a truck driver has experienced "a litany of strange health problems" and a few other people have had a few sleepless nights. But in 2017, who hasn't had a few sleepless nights?